(0 Customer Reviews) | Write Review 6 issues per year Traditional Bowhunter® Magazine is dedicated to hunters who use a longbow, recurve bow or self bow to hunt wild game around the year and around the world. As the premier traditional archery and bowhunting magazine since 1989, Traditional Bowhunter® contains hunting stories, how-to's, bowyer profiles, and links to many of the advertisers in the traditional market. Whether shooting traditional bows for years or just getting started, Traditional Bowhunter® has something for everyone. 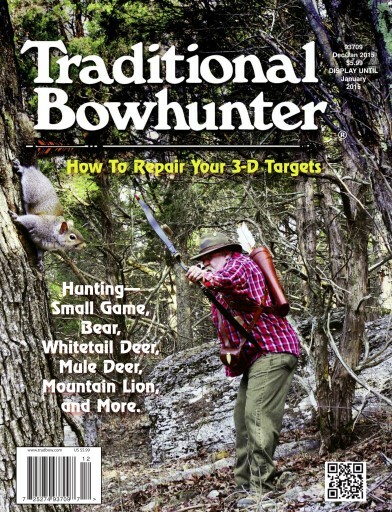 Subscribe today and explore the world of old time archery and woodsmanship with Traditional Bowhunter® Magazine. Traditional Bowhunter® Magazine is dedicated to hunters who use a longbow, recurve bow or self bow to hunt wild game around the year and around the world. As the premier traditional archery and bowhunting magazine since 1989, Traditional Bowhunter® contains hunting stories, how-to's, bowyer profiles, and links to many of the advertisers in the traditional market. Whether shooting traditional bows for years or just getting started, Traditional Bowhunter® has something for everyone. You'll receive 6 issues during a 1 year Traditional Bowhunter Magazine magazine subscription. You'll receive 6 issues during a 1 year Traditional Bowhunter Magazine magazine print subscription.